In the Upper Room Discourse in John 16, Jesus says that there will come a time when he will no longer be with the disciples. How would they live in the absence of their Master? When your source of hope is gone what do you do? How do you maintain this life of communion when your Lord and Master is gone? And what our Lord teaches is that your present pain does not define who you will be. Pain is not the final period in your story it is only a comma. What is the turning point then in the prayer life of the disciples? The disciples—as we have seen—have already asked Jesus many questions. Jesus, when is this going to happen, and when is this going to happen?” Does that sound like us at times? “Lord, just give me a sequence of events in my life?” It’s very instructive that in the four Gospels the disciples ask dozens of questions, but after the resurrection, in the Book of Acts, the apostles seldom asked any questions. Why do you think? Primarily because they were under the guidance of the Spirit of God. And they were living a life of communion with one another. But before the resurrection, they were filled with uncertainty. Do you ever feel uncertain? Take heart. The disciples felt that way often. Jesus is saying that in the period of resurrection the night of darkness and doubt will become the morning of deliverance and hope. Before the resurrection, we asked in doubt, after the resurrection we ask with certainty. Do you realize that before the resurrection no one prayed in Jesus’ name? “Jesus’ name is not a mantra or a magical formula, but a historical and theological reality! Have you ever wondered why we pray in the name of Jesus? It’s because His name is now above every name and His name is able to intercede and speak on our behalf. We can only pray in Jesus’ name because he is no longer dead. Here’s our lesson: Ask boldly. So, how do we pray? We all bring personalities into our prayer life: some are more passionate, some are more meditative, some are more introspective, some are more formal, some less formal. God hears them all. But here is the theme of post-resurrection prayer: It’s the kingdom of God. If you were to dissect the model prayer of Jesus, you would see that point: “Thy kingdom come, on earth as it is in heaven.” If we are to find delight in praying post-resurrectly, then our prayers are to correspond with the priorities of the Kingdom. In other words, our prayers are better grounded when they fall under the mission of God for the world. Sometimes what we are asking in Jesus’ name is really asking in our own name. God will still answer you, but are we missing on a richer answer to our prayer? I believe the answer is yes. God will always answer is, but the question is, “Will he answer us in richly or will he answer from the crumbs of heaven’s table? Now: Heaven’s table is rich and even the crumbs are delicious but are we missing better things from our prayer life because of our lack of boldness, lack of communion, lack of proper priorities? This is a question you and I need to consider today. What we need is not a casual prayer life, but a fiery one that calls the kingdom of God to crush our enemies and answer our needs. What are we asking? And when we ask are we asking in a pre-resurrection manner? Fatalistically, desperately, weakly, cowardly, hopelessly? When the tomb was silent, we did not pray in Jesus’ name, but when the voice of victory rolled the stone away, we pray in the name of Jesus to whom the kingdom, and the power, and the glory belong. What can we learn from the Josh Duggar scandal? So I was wrong about Josh Duggar being a repentant man. Clearly, he isn’t. Or at least he wasn’t. Maybe now he’ll finally begin the process, but it’s certainly impossible to believe that someone could be truly sorry for past sexual sin while currently in the process of fishing for affairs and “experimental” one night stands. He’s a traitor to his family. I feel awful for them, and I pray that Josh really does come to Christ. Beyond that, I pray his wife and kids somehow recover from all of the shame Josh has brought upon them. Because, let’s be clear, if you sign up for an adultery website and then your information gets hacked and your family ends up embarrassed and devastated — that is YOUR fault. You are the one who victimized them. The hackers acted illegally, but this all happened because of your choices. Don’t want your information stolen from an adultery website? Don’t sign up for an adultery website. Pretty simple formula. I must also admit that the more I think about this, I realized I was too easy on the the Duggar parents as well. Jim Bob and Michelle knew that their oldest son was struggling with severe sexual sin, they knew their daughters had been abused, they knew their family was in the midst of moral and spiritual turmoil, yet they STILL decided to put themselves and their children on TV for ten years. I hope others will take the same path and recognize that no matter what royal family one is born into and no matter the influential position he may have in the culture war, no man should be exempt from the lawful discipline of the Church or state, or both. I concur. Josh Duggar is guilty. Repentance bears fruit (Lk. 3:8). There is a long continuous pattern of sexual misconduct by Josh Duggar. At this point we should stop and think why are we so comfortable giving a pass to these Christian celebrities? And then we should consider very carefully how we can begin fighting passionately to protect the many victims in our culture who suffer at the hands of such men, but yet are trivialized into a category of “wrong place and wrong time.” Where is the safest environment for them to be restored and emotionally healed from such torments? Who will care for their trauma? The difference is vast. I am deeply saddened for Josh’s wife and children who will have to live and re-live these awful events due to hyped media attention. As for Josh, words of contrition only go so far. His next few years will prove whether his repentance is genuine or not. I have learned long ago that not all sin is created equal. Repentance can be easily couched in evangelical lingo. Those who defended Josh Duggar without second thought or who assumed his initial incoherent words of confession made everything just fine or who treated repentance like some nebulous concept divorced from the reality of the pain caused to victims will hopefuly have learned a significant lesson: God is not mocked. Sins are not inconsequential. This is not a left vs. right issue. This is an issue of morality and God has made clear that his justice will not be in vain. Josh Duggar affirmed that, “He is the biggest hyprocrite ever.” But hypocrisy can only be dealt with by understanding what God hates and what he loves. 19 A false witness that uttereth lies, And he that soweth discord among brethren. Duggar’s long history of sexual perversions was not born after a particularly miserable day. There is a pattern of thought and action. There is an anatomy of evil involved. There is a whole-body determination to follow these sins from the eyes to the feet. There is a calculated narrative that culminated in sexual abuse and adultery. For those who do evil the feast of the wicked is incredibly appetizing. One drink leads to another and only increases the hunger. Where do we begin then? If situations like this do not cause us (particularly men) to be ever cautious then we will not have learned from it. Every person’s crime is a reason to re-consider our strategies to fighting sin and living righteously. If I had five minutes to counsel Josh I would tell him to look at this list and begin to detail where his narrative went awry. Where and when did his eyes become arrogant and haughty? At what point did he think he was invincible? At what point did he rationalize the presence of God away from his actions in secret? Then, when did he begin to put into words his pride by lying about his reality? I would be sure to point him to Jesus; not the Jesus that dismisses sins, but rather takes them with utmost seriousness and urges him to put on Christ and put off the deeds of darkness. Josh needs to re-consider this list. He needs to see grace as redeeming the mind and abolishing calculated plans for evil. God has plans of his own. His plans involve demolishing our plans and replacing them with plans that are good, true, and beautiful. The task is great. Josh is only a clear example due to his high profile status. There are many Joshes out there currently afraid that they may be found out; afraid that their secret adventures will come out in Duggar fashion. The good news is God has already found you out. The bad news is that God has already found you out. In the end of the day to be found out by God is the best news. His throne is justice. He makes no mistake. His discipline will hurt, but it will not damn you. Accept it. Receive it. Confess it. Find refuge in Him. Note: It’s not very common to post writings from others on my own blog, but I have done it a few times in the past as a way of revealing my joy in exposing the profound observations of others. Tom is a dear friend, parishioner, and a capable student of the Bible. He took a single thought from a sermon of mine and developed it to something much better than I could have written. Uri Brito is the pastor (my pastor) at Providence Church in Pensacola. The quotation above comes from a sermon he preached a few Sundays ago. The Apostle Paul is familiar to you all. His words were written nearly 2000 years ago from an Ephesian prison. I believe Uri’s illustration may be a little unsettling to the average Christian, especially when compared with Paul’s description of Heaven as “gain” and “far better.” Now, no one believes Pastor Brito is talking about mere drawings and measurements. However, he is at a minimum suggesting that Heaven is a kind of starting point and not the finished product. After all, a blueprint is the plan, not the dwelling place. If this is true, then it follows that Heaven is imperfect. And this sounds a bit alarming. A Place Where No Storm Clouds Rise? Most of us – at least most of us in “the South” – grew up singing songs that promised we’d leave this world and fly to a place of eternal and undiminished joy. Our understanding was that Earth is toilsome, a place where we must spend “just a few more weary days.” We all thought Heaven to be a place where “no storm clouds rise”, where “joy shall never end”, “no tears ever come again.” Heaven was not a mere temporary lodging. Yet, scripture teaches that Christians will live in a new heavens and a new earth forever and ever. In fact, all things will be made new (Rev 21:5). We ourselves will be made new; our resurrected and glorified bodies will be fit to enjoy a renewed cosmos (Phil 3:21). So, we will not live forever in Heaven. In fact, Heaven and Earth were never intended to exist forever as separate places. The plan was always for a unity (See Gen 1 and 2, Acts 4:21, Phil 3:20-21, Col 1:20, Rev 21 and 22). At the moment, however, we are in the midst of a cosmos which has undergone what C.S. Lewis described as The Great Divorce. When Adam sinned creation “fell”; Heaven and earth were “torn asunder” with all the resulting pain and consequences of a divorce. It was Ephesians 1:9-10 – “making known to us the mystery of his will, according to his purpose, which he set forth in Christ as a plan for the fullness of time, to unite all things in Him, things in heaven and things on earth” – which occasioned Pastor Brito’s comment “Heaven is the blueprint; earth is the raw materials.” God’s plan, said my Pastor – said the Apostle Paul, no less – is to unite all things in Christ, both in heaven and on earth. It has always been the plan, which is why Jesus taught us to pray, “Our Father who art in heaven, hallowed be Thy name, Thy kingdom come, Thy will be done on earth as it is in heaven.” Neither Heaven nor Earth is meant to be alone. Does this mean that heaven is not a pleasant place? Certainly not! Paul’s confession, that to “die is” not only “gain”, but “far better” (Phil 1:21-23), settles that. To be sure, the comfortable accommodations of heaven are preferable to a sin-ravaged world. Yet, Heaven separated from Earth is imperfect – imperfect, but not defective. Neither was Adam defective. Yet, He was not perfect until joined to Eve. Just as it was not good for Adam to be alone, it is not good for Heaven or Earth to be alone. The ink pen resting on the desk is not defective, but when taken in hand, put to paper and employed by a master poet it becomes perfect. Similarly, Heaven will become perfect when it is intertwined with a gloriously liberated Earth. So, until then, we are to do what we can to “heavenify” earth, so says my Pastor – “Heaven is the blueprint; earth the raw materials.” And if we happen to leave this Earth before Christ speaks into existence a new cosmos, we’ve been told by a reliable source that our temporary accommodations will be quite comfortable. For to depart and be with Christ is “far better” says Paul – far better, but not perfect. Most merciful God, we celebrate with great delight your good gifts this evening. We delight in this community of saints; for the peace You have established among us; for the faithfulness manifested in your church and in the many homes represented this evening. May we remember that because of the incarnation, we have life and life more abundantly. Bless our friendships; take joy, O God, in our joy for you created us to reflect the blissful harmony of the Trinitarian community: Father, Son, and Spirit. Our God, not only did you create wine, but commanded that it be included as a necessary part of the sacrifices that your people offered (Ex. 29:38, 40;Lev. 23:13;Num. 15:5, 7, 10; 28:7). Wine was part of feasts (Dt. 14:22-26) and a prerequisite to “rejoicing in your presence.” The Psalmist declares that wine is given to gladden our hearts, and indeed may our hearts be glad, for enjoying your good gifts is what we are called to do in this world and for all eternity. Wine even gladdens your own heart, O God, which speaks of how much we resemble our Creator. With thanksgiving we remember that the greater Noah, Jesus Christ saw fit to turn water into wine, and by doing so making wine the Christian drink in the New Creation. Grant us hearts filled with gratitude for you drank the sour wine at the cross, so that we might drink the sweetness of the wine in the new world you established by your resurrection. For this, we bless you and thank you for no man can take this joy from us, because of our King, Jesus Christ, who was born of a virgin and now rules and reigns with the Father and the Spirit world without end. Amen. Lover of the human race, kind heavenly Father, on this anniversary of the tragedy that befell our nation 12 years ago, we pause under Your embrace to remember. We remember those whose lives were lost that fateful day. We remember the compassion and courage of our first responders. We remember the families that were torn apart, never to be united again in this fallen age. We remember all who ministered to broken hearts and sought to bring them Your comfort. We remember the way our nation changed that day. And as we remember, we beg Your mercy on all who carry wounds of heart, body or mind. We ask Your mercy on all who continue to serve in our armed forces, strengthening and upholding them in every good deed. We ask Your mercy upon all our first responders who so frequently put themselves in harm’s way to protect us. We ask Your mercy for our public servants that they be given wisdom as they continue the struggle against terror and violence in our world. We ask Your mercy also on those who meant us harm, begging You to give them the gift of repentance, changed hearts and new minds. And we ask all these things in the name of Him who knew in His own body the pain inflicted by unreasoning hatred and religious violence, our Lord Jesus Christ, whose love triumphs over all, whose forgiveness holds us fast, and who lives and reigns with You and the Holy Spirit, one God, now and forever. Amen. My article entitled 10 Reasons Why You Should Sing the Psalms received a lot of attention and several days later it is still on the front page of The Christian Post. I am grateful for all the e-mails I received from pastors and parishioners alike seeking to benefit from the psalms for their own spiritual edification and the maturation of their own congregation. In order to provide those resources to a broader audience, I will list many of them here and hope to update them occasionally. I’d encourage you to visit the Genevan Psalter website. It will provide music and lyrics and a host of links to articles on the Genevan Psalter. This is my favorite Psalter. You may also wish to visit this site, which will give you some ideas and a general introduction to psalm singing. Another way to benefit from sung psalms is to simply start listening to psalms on your ipod or computer. For a more contemporary rendition of the Psalms, this CD by Greg Wilbur with Psalms and Hymns published by Ligonier is quite good. Nathan Clark George has done some beautiful versions of the Psalms with guitar accompaniments. If you want to listen to some beautiful Scottish Psalmody, go here on Groove Shark. Finally, for an award-winning website with more information on the Psalms and psalm-singing than you will ever need has been compiled by the saints of Trinity Presbyterian in Birmingham, AL. called The Psalm Project. NOTE: If you find any additional resources, please let me know. Though the last hundred years were not psalm-friendly, we have seen in the last 30 years a kind of revival of psalmody in the modern church, especially in the Reformed tradition. New hymnals, like the Cantus Christi, and many others are including old and new psalms ( metrical and chants). So why should we sing the psalms? Aren’t the 19th century hymns and contemporary songs sufficient to fulfill the worship demands of the modern congregation? First, Psalm-singing is an explicit biblical command (Ps. 27:6). The Scriptures encourage us to sing “psalms and hymns and spiritual songs, with thankfulness in your hearts to God” (Col. 3:16). To have the word of Christ dwell in you richly means to invest in the rich beauty of the Psalter. How can we sing what we do not know? Is there a better way to internalize the word than to sing it? Second, Psalm-singing was the ancient practice of the Church and it continued for 1,800 years. We honor our forefathers and our history when we sing their songs. Third, Calvin observed that the psalms are “An Anatomy of all Parts of the Soul; for there is not an emotion of which any one can be conscious that it is not represented here as a mirror.” The psalms are satisfying to the human being. We are homos adorans; worship beings. God is not against emotions, he is against emotionalism. The Psalter is an emotional book. It provides comfort for the people of God at different stages of life. As a minister I have never once walked into a hospital room and been asked to read a text from Leviticus or Romans, but rather every time I have been asked to read a psalm (most often Psalm 23). The psalms reach deep inside our humanity in time of pain. Sixth, we should sing the Psalms because they re-shape us; they re-orient our attention. We are a people constantly being sanctified by the Spirit of God, and the Spirit has specifically inspired 150 psalms for our sanctification. How should we pray? How should we ask? How should we lament? The Psalms helps us to answer these questions, and thus shape us more and more after the image of Christ. Seventh, by singing the Psalms we are worshiping the Spirit. The Spirit hovers, shapes, re-makes in the Bible. He is the music of God in the world. In an age when the Third Person of the Trinity has become the source of theological confusion, the Psalms keeps us focused on His role and purposes in history. Eighth, we should sing the Psalms because our current songs are often cheap and shallow. The Psalms are rich and full of substance. If we wonder why the evangelical community is so powerless, one reason for this is its trivialized worship. Modern worship is often a pietistic exercise, which is manifested in poorly constructed and pessimistic theology. But the Psalms teaches us that God is full of mercy and powerful over all His enemies (Ps. 2). The Psalms are political statements. They are direct attacks on those who challenge the supremacy of King Jesus. 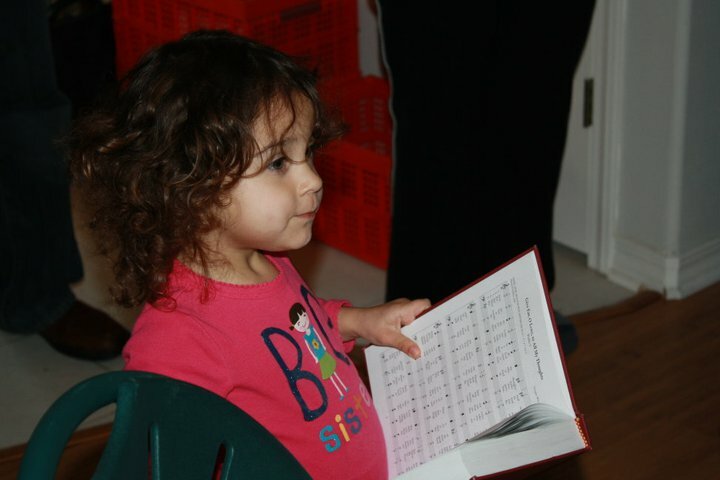 Ninth, the Psalms should be sung because our children need them. Our little ones need to know the God they worship in profound ways from their earliest days. We become what we worship, and so our children will become what we sing. Tenth, you should sing the Psalms because the world needs them. The world does not need a weak Gospel. She sees plenty of it already. She needs to hear a Gospel of a God who delights in praise, who will not allow evil to go unpunished, and who prepares a table for us. This may all sound daunting and strange. But I’d encourage you to take that first step. What first may appear to be strange may become a wonderful journey into praise and thanksgiving to the God from whom all blessings flow. For more information on how to sing the psalms, or for resources, please contact me at uriesou@gmail.com. Holy and Blessed be Your Name forever and ever. History tells us that evil exists. The bombing at the Boston Marathon is a reminder that the effects of sin live on in this world. And in moments like these creation’s expectation increases for a recreated cosmos. The Psalmist tells us that evil people are trapped by what they have done. We pray that their traps will swallow them. We pray also that your righteous sword will act speedily in dealing with these unrighteous acts committed by lovers of evil. We pray especially that those deacons of righteousness would act speedily on behalf of those who grieve. May unrighteousness perish! We are also mindful of those who lost loved ones. We ask that you would comfort them by your Spirit. As the Gospels attest, we pray for the ultimate triumph of good in this world. And for this to happen your Church needs to act in deed and mercy towards those who weep. May we grieve together and never forget that only Christ can truly wipe away our tears. We ask that you would provide wisdom to pastors, especially in Boston, as they guide their congregations this coming Lord’s Day in prayer and supplication. In times like these, we are reminded of our finiteness. We are reminded that we are as vapor that appears for a little while and then vanishes away. So remind us, O Lord, that our days are numbered, but also refresh our hearts in the task before us. May we not grow weary in doing good, and though our days are numbered, your kingdom has no end. Our prayers are not in vain, because we ask these things in the Name of the merciful Lord; the One who never closes His eyes or ears to the cries of His children. Lord, hear our prayer.